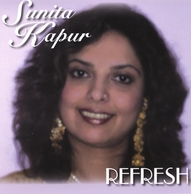 “REFRESH” is a blending of vintage classic songs from Indian cinema with contemporary sounds. It is an infusion of a modern attitude, without detracting from the soul of these popular melodies. “REFRESH” will indeed refresh your memories! Produced and performed by Sunita Kapur,this Album is an infusion of a modern attitude, without detracting from the soul of these popular melodies. “REFRESH” will indeed refresh your memories!